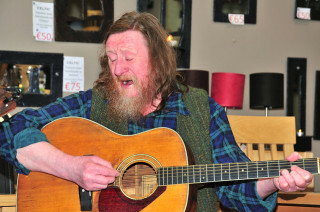 My friend Pat Conneely, who has died aged 57, was one of the finest and most respected traditional Irish singers in Co. Galway (fierce competition there!). Every Sunday morning for thirty years a man with shoulder-length hair and a big beard, carrying a scuffed guitar case, would hitch-hike from Oughterard to Galway, to MC the famous Crane Bar session with Sean Ryan or Tim Lyons. He always got the lift: everyone knew Pat, who resembled a Gaelic warrior, which indeed he was. Instead of a sword, he used a beautiful old Yamaha guitar and a majestic, dark-brown voice, with exotic Celtic bends and harmonies. An ancient, atavistic sound (the hair rose on the back of my neck, “I’ve found The Man!”, (thought I), as if somehow he’d always been there, through centuries of Irish history, troubles, joy and suffering. It was like running across Robert Johnson or Howlin’ Wolf, for Pat was the real Irish blues incarnate, long eyelids closed, head thrown back, that voice a primal keening. He could play with anyone, and he lived the life.Pat was also a passionate Republican and socialist. We unexpectedly bonded in a few minutes conversation via a common reverence for Sweeney’s Men (close friends of his), the struggle for a United Ireland, the drink, Bob Dylan, and a mutual detestation of Thatcher. This did not prevent his mischievous sense of humour from introducing me as: “Me English friend! Know how we met? A big row, over Bobby Sands, MP!” This horrified Galway locals, who didn’t recognise a private joke, involving my error over authorship of ‘Back Home in Derry’. (JR: “Was that by Christy Moore?” PC snaps: “Twas not! ‘Twas by Bobby Sands, MP!” JR: “Oh, yeah, of course. Took him 66 days to die, didn’t it? I felt ashamed to be English, 1981…” Shrewd look from PC: “Don’t feel like that… Look what she did to the miners. It’s not where you come from that matters, it’s who you are!”) He was wise like that. Then a kind wink, from the darkest blue eyes. Mad craic, wonderful hospitality, family, comradeship, the funniest jokes, the best drinking partner. Two CDs are available online and from the Oughterard Tourist Centre by his band, Ardvarna. Little-known in England, Pat’s name and fame will live on, from Kerry to Derry. He is survived by his wife Grace, and sons Gavin, Daire and Cean. My sadest moment this year:by accident I found this page… Pat’s name and fame will also live on in Germany – we lost contact but when ever I teach my grandchildren irish tunes it’s Pat Conneely and Oughterard I’m talking about!